Although most of our prescriptions are filled within 10 minutes and most of our stores have drive -through windows, if you’re stuck at home OR at the office, you can still receive your medications with our confidential and FREE delivery service. 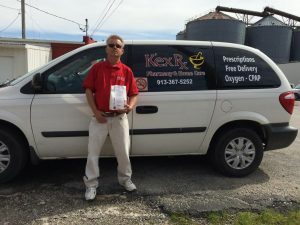 We deliver in-town to residents of Hiawatha, Horton, Atchison, Falls City and to Highland residents on Mondays, Wednesdays and Fridays from our Hiawatha location. 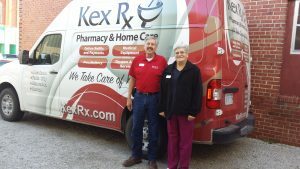 If you haven’t already discovered the convenience of having your medications brought directly to your home or office, please call your local Kex Rx Pharmacy location today for details. If you live outside the city limits or are staying with a friend or relative for a few weeks, please consider our Mailing Services. Instead of running out of your prescription medication, call us and we can fill your prescription and mail it to you Free of Charge!